Stay cozy this winter in Defeet's Woolie Boolie Socks. With a high quality merino construction, these U.S. made socks are warm, breathable, and naturally odor resistant. The Woolie Boolie Sock is available in Black and features a 4 inch cuff. These are my first wool socks. The did their job as purchased. I did find that the size was small. I have size 12 feet and ordered the XL. They barely fit on first try. I haven't tried since I washed. Fit well and are warm. Get em on sale and get a bunch. These are simply the best. Has a cute sheep on the bottom. Buy them and you won't look back. You'll just look for more pairs. Unless it is in the high 60's my feet freeze on the bike. These socks have come the closest to helping this problem. 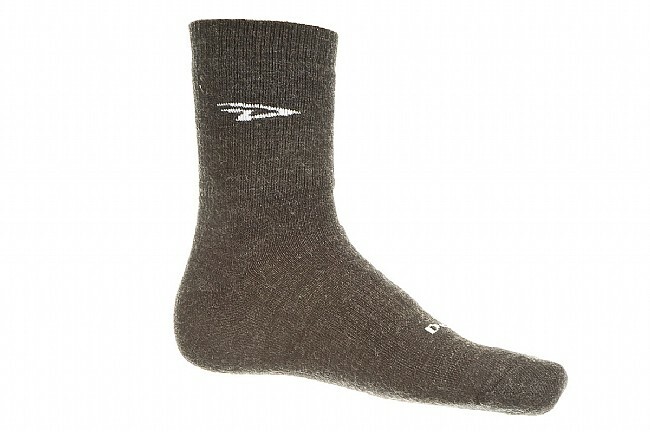 For the average rider who gets chilled feet, these socks ought to do the trick. i have size 10 4E feet, based on the scale from website i fall into the large size. when the socks arrived i tried them on and immediately knew i should have bought the XL. buy a size up from your normal size they run small. also do not dry wool socks... girlfriend turned them into a pair she could wear... once i got the right size, socks workout well. These socks are great for cooler weather rides. Combined with a water wind resistant over shoe there wasn't a day that my feet got cold. Great padding and not hot spots. These are the only socks I ever wear. Winter, spring, summer, fall. Not hot in summer. Great fit, so comfortable. Thicker than most cycling socks but my toes need a little cushion. Perfect socks for the cold or for mild weather! These socks are great for all weather riding. I prefer them for cold weather and along with toe covers I can ride for up to two hours in mid to upper 30's without my feet or toes getting uncomfortably cold. Below the mid thirties I always add shoe covers. Great sock! I've worn WB's for the past several years. While the V2's seem slightly thinner than its predecessor, the toe box is more comfortable. The height seems like it is also slightly higher on the ankle. I wear these year round and they keep my feet as comfortable in the summer as in the winter. They're very durable too..my older pairs are likely in their 5 year of use and still not showing thin spots. While they're not cheap, from a comfort, durabiltiy and cost per wearing, I feel they're an exceptional value. DeFeet Woolie socks have been keeping my feet warm through a lot of winters. I cycle and bike commute year-round, so it's important that I keep my feet warm. Woolie Boolies have kept my feet warm riding in temperatures down to the mid-teens F, with only toe warmers covering my shoes. The wool is soft and not itchy. To top it off, DeFeet socks are made in North Carolina, USA! These are probably the most comfortable socks I've ever worn. Or at least they're up there. After riding outside on cold days, I actually leave them on because they're so nice. Very thick wool sock, great for cold days. Thick wool sock. I prefer a little thinner sock, but my wife loves them.